Saturday we celebrated our beloved Dance Recital. 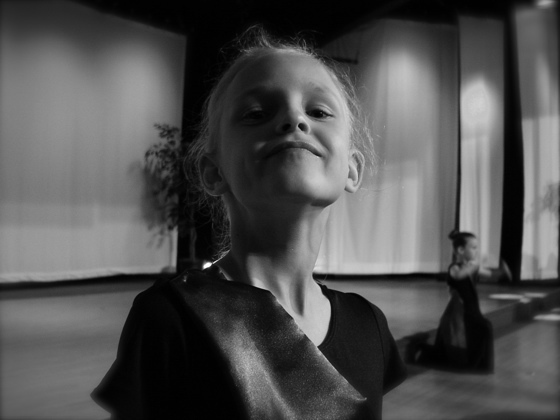 I have told the girls’ teachers before that we really don’t care about the quality of the program – as parents, we just want to see our kid get a few minutes on the stage in exchange for the many hours they’ve spent in the dance studio in the back hallway. We want to see them kick up their heels or sah-shay or whatever it is that they do. But sometimes, even when our expectations are low, they take our breath away. We don’t know why because it usually isn’t the precision of their movements or the grace with which they turn. It is mostly that they are there trying and to us it is beautiful. 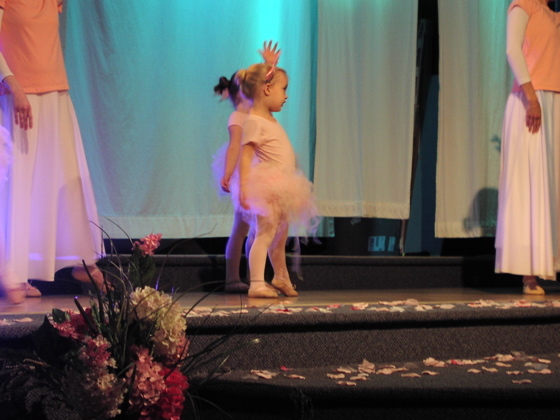 Macy was part of her first recital this year. To see her tiny eyes glued to her teachers and then see her legs and arms straining to match them pose for pose was priceless. So much effort from her produced pure joy in me. Ada seems to be growing inches every week and, no exaggeration, just last week she knocked her feet out from under herself from a still and upright position. I have never laughed harder at a crying child. And yet on that stage she has some kind of magic. Clumsiness disappears. Sometimes when I look at that girl I feel like I’m watching the beginning of something so special I don’t have words to describe it. Claire. I don’t need to say much more if you are a regular here. Claire is our miracle girl – a preemie with a very uncertain future. She surprises us everyday. But our hearts also break because of the physical limitations of her body. Just months ago she had surgery to lengthen the muscles and tendons on her left leg. Her left arm is uncooperative and stiff. But Claire loves to dance. She had one move, an arabesque I think, that she was quite proud of. I noticed her smile when she got it right. The rest of the time you could tell her mind knew just what to do even though her body wasn’t obeying. But she never looked frustrated. She smiled and jumped a little faster to catch up or flipped her head as if to say, ah, maybe I’ll get that one next time. And we cried because she is so brave. So much braver than we are. These are lessons I learn while I watch them learning to dance. Sniff. Sniff. I love these photos and I love the bravery of these girls…and the beauty they bring to the dance and to their lives. They have much to teach us all. After the privilege of seeing them practice several weeks ago I can clearly see in my mind’s eye what you have described and have some of the same responses as you and Dan! The girls are so beautiful! I loved reading this. You are such a good writer! I can just imagine your girls reading this someday or even soon and being greatly encouraged by it. I miss your family but this helps a little, thank you for sharing! We miss you too, Ryan! Thanks for saying so! I cried through the whole thing, as always. As you said, pure joy! The ones who really got me this time were the middle school girls. So self-conscious at times they can barely breathe for fear someone will notice, they were graceful and powerful and brave. I love it when our friends help us get past our insecurities to do what we love. And I’m a mess all over again because you captured it in words as beautiful as their movements. Thanks for allowing me to see them dancing through your beautiful words! Tears! I missed the recital ans was sad, butyou have described it beautifully! Beautiful. It all was. And as I told you before, watching Claire was enough to make me lose it…she is such an inspiration with her “i’ll give it my all–and with a smile” attitude, but then just the goodness of God that has transpired and is continuing to transpire in her life. So thankful to be reminded of the simple joys; I’m sure our Heavenly Father smiles at them too.